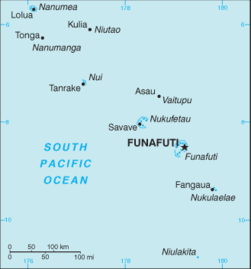 Tuvalu, formerly known as the Ellice Islands, is a Polynesian island nation located in the Pacific Ocean midway between Hawaii and Australia. Its nearest neighbours are ► Kiribati, ► Tokelau, ► Samoa, ► Wallis and Futuna, ► Fiji and the ► Solomon Islands. Comprising 4 reef islands and 5 true atolls, with a total land area of just 26 square kilometers (10 sq mi), it is the second-least populated independent country in the world, Vatican City being the smallest. It is the smallest member by population of the United Nations. More images Tuvalu - Tuvalu (Category). 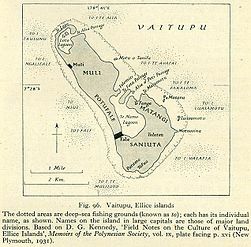 Map of Tuvalu in English. 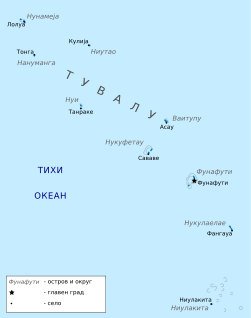 Map of Tuvalu in Macedonian. 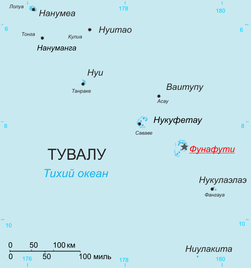 Map of Tuvalu in Russian. Map of Nukulaelae in English. Map of Nukulaelae in Macedonian.